It’s no secret that changing urls can be dangerous SEO-wise. In the past, I’ve written heavily about the dangers of website redesigns, migrating to a new CMS, and changing domain names. Basically, whenever you mass change urls on your site, you can run into serious SEO problems. And that includes migrating to https (which many sites are doing now). For example, there are a number of things you need to do in order to maintain search equity during the change. That includes nailing the redirection plan, properly changing canonicals, handling the site move correctly in GSC, updating your CMS settings, and more. And the redirection plan is a critically important step that enables you to pass all signals from the old urls to the new ones (on a one-to-one basis). If you don’t, you can pay dearly. But while many people focus on the SEO aspects of changing urls (for good reason), there’s another issue that often gets overlooked. And it can also have a big impact on your business. 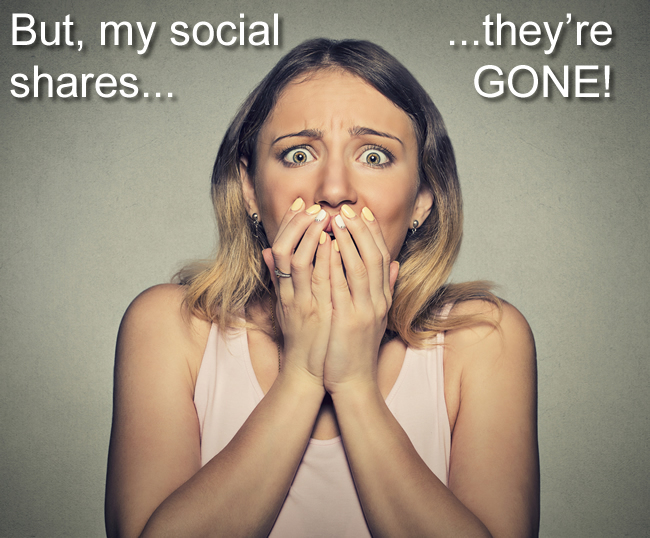 It’s the dreaded loss of social shares. Every website needs to be redesigned at some point, and now many are switching to https. So, changing urls is inevitable for many business owners. And if you have spent a lot of time publishing killer content that has built many social shares across posts, then the last thing you want to see is a major loss of shares. Social proof can be powerful, and watching a post go from 1,546 shares to 0 is enough to make even the toughest digital marketer cringe in horror. So, we’ve got a tough situation. On the one hand, you want to improve your site, migrate to https, etc. And on the other hand, you can potentially lose all of your social shares in one fell swoop. And the social networks aren’t helping matters. Try and find solid documentation from them about retaining shares when you change urls. There’s really no strong documentation that covers the situation, which is unfortunate. By the way, the major social networks should follow Google’s lead support-wise. Google provides an outstanding site move section in their webmaster support area. I wish Facebook, LinkedIn, and others would do the same, but that’s for another post. I started using social warfare a while ago for displaying social shares on my blog and it’s a great plugin with a boatload of functionality. But, it ends up they added even more functionality that is mind-blowing, especially for someone like myself who helps a lot of companies with website redesigns. They added “Share Recovery”. As you can guess, the smart people at Social Warfare developed a solution based on a global need. And you might actually build a statue for them after using it (as you stare at your glorious social shares from your old urls, combined with shares from your new ones). Based on my experience, it’s been a great solution. Once you install and set up the plugin, Social Warfare will check both the old url and the new url for shares, and then combine the results. So you will have both the old shares and new shares (including any brand new shares you build over time), all wrapped into one. Awesome, right? The UI in WordPress handles most of what’s listed above, but switching domain names is a little trickier (yet still relatively easy to implement). You’ll need to add a small section of code to your theme’s functions.php file instead of using the UI. I’ll cover that scenario below. Below, I’ll cover step-by-step how to retain social shares when changing your domain name. Again, you can handle several url changes using Social Warfare, but I’ll focus on switching domain names for this example. I’ll use domain1.com and domain2.com to keep this simple. Also, you obviously need to be running WordPress so you can use the Social Warfare plugin. The Social Warfare plugin is not free, but it’s extremely reasonable pricing-wise. A single site license is just $29, while a package for up to five websites is $135. Once you buy the plugin, go ahead and install Social Warfare just like any other plugin. Once it’s installed, you’ll need to register the plugin. Note, you don’t need to change anything here when just changing domain names. But it’s good to review this list in case you had permalink changes, you are migrating to https, etc. I mentioned these options earlier in the post and this is where you would select or enter the options matching your own specific url change. But again, for straight domain name changes, you don’t need to change these options. Keep them as-is. But again, you must still activate share recovery like we did in step 2 for domain name changes. I mentioned earlier that a straight domain name change isn’t handled via the options in the UI. Instead, you’ll need to use the code below and paste it into your theme’s functions.php file. Then you’ll need to edit two lines of the code. Note, if you don’t know where that file is located, contact your designer or developer. They can point you to the file quickly. Also, make sure you back up your site before making any changes. You should be doing this anyway, but it’s always good to ensure you have a backup before you make any changes (even minor ones like this). 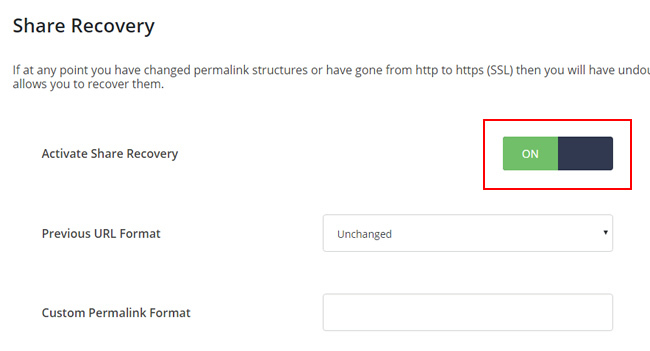 And make sure you have a backup of your functions.php file so you can always re-upload that older version if needed. The only two lines of code you need to edit are the current domain and former domain lines. This should match your WordPress install. The easiest way to know what to put here is to check your General WordPress settings. For example, if your install is in a directory, then that will look different than a root install. Again, check your General Settings in WordPress, which will provide exactly what you should include in the code. If you don’t match that exactly, then share recovery will not work. I repeat, if this doesn’t match perfectly, your old shares will not show up. 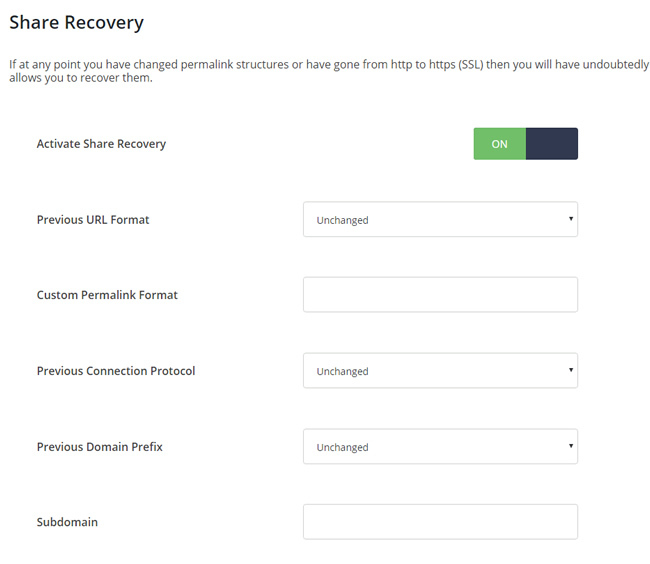 Remember, “Share Recovery” must be turned on in the UI for this to work (covered earlier). So even though you are adding code to your theme’s functions.php file, you still need that option turned on in the WordPress settings for the plugin. Next, once you upload the new functions.php file, there are querystring parameters you can add to your urls that will show the previous url at the top of the post (using the old domain name), while also rebuilding the Social Warfare cache. This will help you debug and test the setup. If you don’t clear the Social Warfare cache, then you might not see the true share count. So it may be working, but you simply won’t think it’s working. 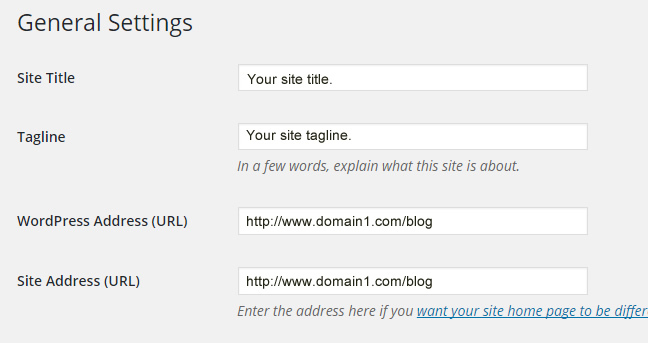 Note, the old url will only show up for you, since you are using the parameters I’ll give you in a second. Normal visitors will not see the old url. So, add the following querystring parameters to the end of any url you want to test that has older social shares. Once you do, and refresh those urls, you should see the old url at the top of the post and then the share count should reflect shares from both the old and new urls. 7. Enjoy your updated share counts and benefit from social proof again. If the share count changed (increased), you’re good to go. Please send chocolates, golf balls, or new darts to the address listed on my site. :) You can rest assured that your older posts will reflect shares from both the old url and new one (combining domains). That’s for most urls. More about that next. Side Note: What’s up with Facebook? Note, I’ve seen some very strange things with Facebook counts (and this is NOT just a Social Warfare issue). For some reason, Facebook will sometimes not show the accurate number of shares from the old url. It does work for many, but not for all. I can’t explain why that’s happening and I’m pretty sure nobody can. So, you might see some urls that regain almost all of their Facebook shares, while others don’t get all of them back. Hey, those are the breaks. You can’t win them all. Changing urls on a site can be a risky proposition. And although many people focus on the SEO impact, social can also take a hit. When changing urls, you can end up losing all social shares, which can be horrible when you’ve spent a lot of time and resources building those shares! But by using Social Warfare, you can regain those lost shares (and keep building them as time goes on). I recommend trying Social Warfare. I think you’ll dig it. Good luck. 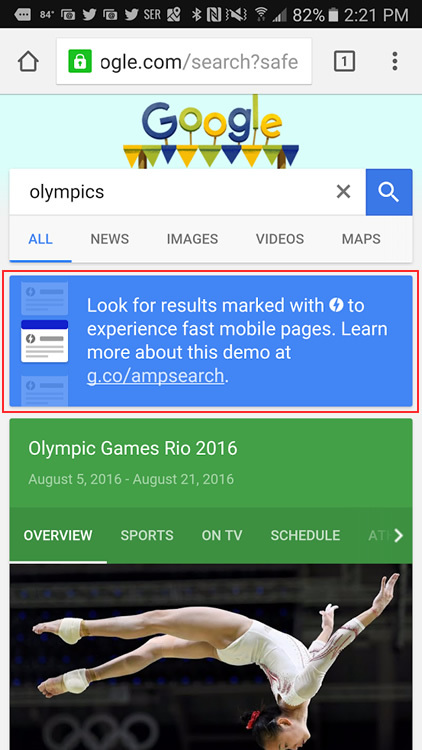 On Tuesday, Google announced a demo of accelerated mobile pages (AMP) in the standard search results. 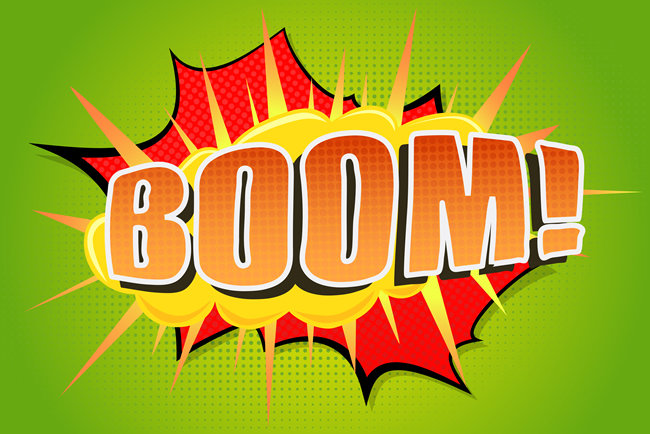 That was huge news and should have every website that’s publishing content take notice. Until the demo was announced, amplified pages would only show in very specific areas of the mobile search results, like the “Top stories” section (via a carousel). But with the demo, Google is showing that any AMP could potentially show up in the standard search results, from any site, and in any country. That would mean AMP could jump out of the carousel and into the main search results. Again, that’s big news. And for those of us in SEO, it’s easy to get ultra-excited about this. 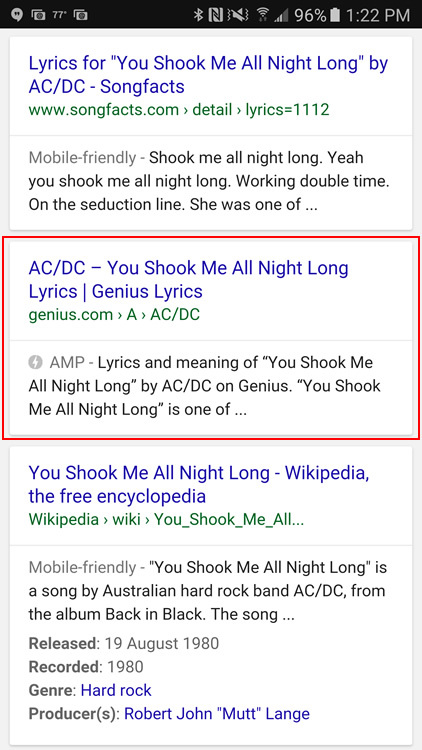 Although there won’t be a direct ranking boost based on having amplified pages (yet), enabling users to quickly launch near-instant pages from the search results, along with the display an AMP icon in the SERPs, is exciting (and we believe this can give us and our clients an advantage). 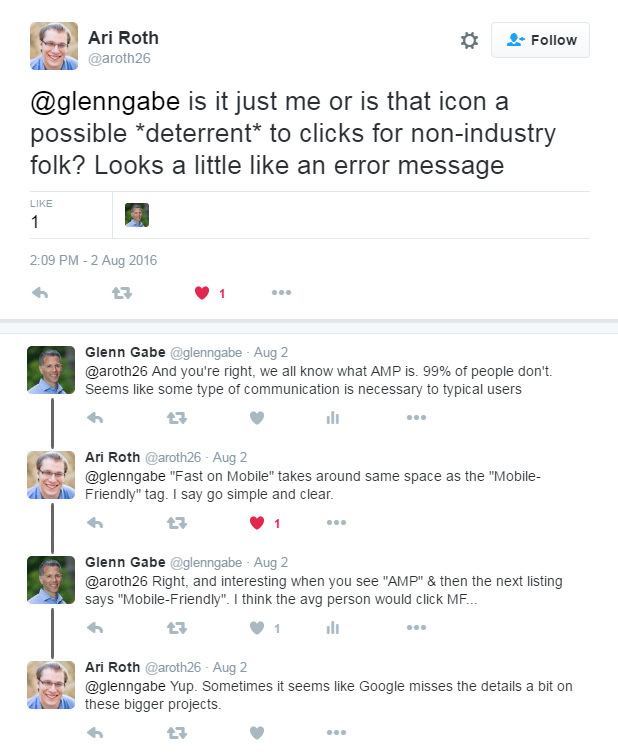 Right after tweeting out the demo, Ari Roth replied to me asking if I thought the average user even knows what AMP is? And if they understand what the AMP icon is, and that it would mean a better user experience on their phones? And at that moment, I realized I might have been viewing AMP through an SEO lens only. Sure I know about AMP and its benefits, but what about everyone else in the world outside of the search industry? I replied to Ari saying that was an excellent point. Looking back the demo and seeing both AMP icons + mobile-friendly tags, I couldn’t help but think that the average user might understand mobile-friendly way more than AMP with a lightning bolt. And if that’s the case, wouldn’t that yield mediocre results for amplified pages in the search results (at least in the short-term)? And couldn’t that possibly lead to even more click through to mobile-friendly pages versus amplified pages? There’s not much data from publishers yet performance-wise, and again, AMP is only displayed in limited areas right now in the search results. But Barry Schwartz recently provided some stats based on Search Engine Roundtable implementing AMP. He is seeing lower click through rates from AMP, and that got me thinking that maybe the lower CTR is due to an AMP perception problem. I wanted to learn more. So, I fired up survey monkey and created a really simple two-question poll. I basically wanted to know if people outside of SEO knew what the AMP icon was and what it meant. And then I wanted to know if they would be more apt to click the AMP result or the “mobile-friendly” result. So I took a quick screenshot of a lyrics search (I’ve helped a number of sites in that niche and Google even said to test out lyrics searches in the demo). Then I created the poll and started emailing friends of mine that were not in the SEO industry. In the past day or two, 44 people have now taken the poll, and most of the people are between the ages of 25 and 50. But I even received a response from a 9-year-old (yes, 9-year-olds search Google too), as well as a response from a 75-year-old. None of the respondents are involved with SEO. Most of the respondents consisted of professionals from several different industries. The results were fascinating, and made a lot of sense when you take a step out of the SEO bubble for a minute. Read on. Important note: I’m not saying that 44 people represent all internet users… It was just a quick poll to people I know outside of SEO. But almost all of their responses were identical. My core point is to simply raise the important question of whether the average Google user has any idea what AMP means, and if that would get them to click the AMP listing versus another that says “mobile-friendly”. Also, I understand that using a lyrics search result with AMP listings could have some people thinking there’s a music connection. That just happened to be the screenshot I pulled. That said, it doesn’t take away from the point that users might not understand what AMP is. In other words, if someone thought it was connected to music, then they don’t understand what AMP is overall. And I encourage you to ask people you know outside of SEO the same questions! You might see different results than I did. Or, you might see the same results. 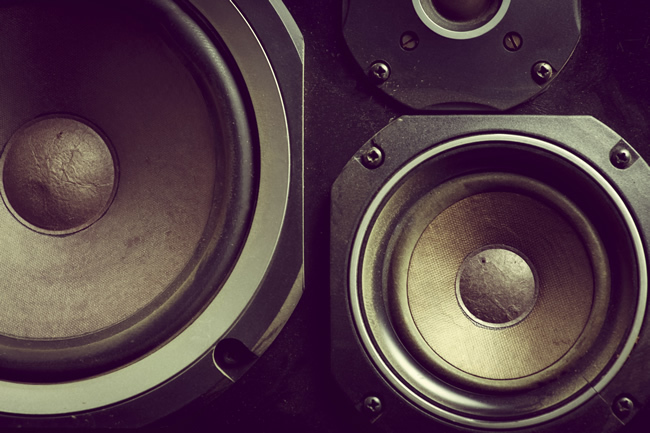 It’s important to understand user perception before taking the AMP plunge. And I think it’s important for the future labeling of AMP in the Google search results. In other words, should it be labeled AMP, or maybe something more descriptive? More on that later. Out of 44 responses, only three people answered the question accurately. Almost all respondents answered “I don’t know” or some variation of it. No idea what amp means. Gives you faster access to the content. I am not familiar with the acronym. I only know of one “amp” related to music, but I’m certain this has nothing to do with this music website. I believe it to mean some sort of quicker connection. AMP with the electric bolt. My first thought is that the page is amplified … plays music, perhaps or has extra content that amplifies it some way. But this is likely not correct. I don’t know what it means, and probably would not open the link until I found out what it means. First look, I have no clue, but think something to do with publishing? I don’t know what AMP means. It doesn’t mean anything to me. First thought was some kind of electrical “amp”. Amplify? I actually have no idea. I’m actually not sure what that means. AMP seems like it may be the name of a music website, especially in the context of music lyrics. Or it could stand for some kind of premium service, like a result that is “amped-up” beyond the regular result. It adds a little confusion because I’m not clear what it is that I’d click on. It looks like an acronym for some group related to music and copyright. After seeing the responses, I couldn’t help but think that the low click through rates some sites are seeing could be due to overwhelming confusion about what AMP is. Only three people knew what it was, and most had no idea. And then you have “mobile-friendly” sitting right below it, which is extremely clear about what it means for users. That’s a great segue to my second question. Question 2 – Which result would you choose? Out of 44 responses, 29 chose “mobile-friendly”, 13 selected “I don’t care which tag is displayed”, and only 2 people chose the AMP listing. WOW, only two said they would choose the AMP listing! Three people actually knew what AMP was, but one of those three still chose to select the “mobile-friendly version”. 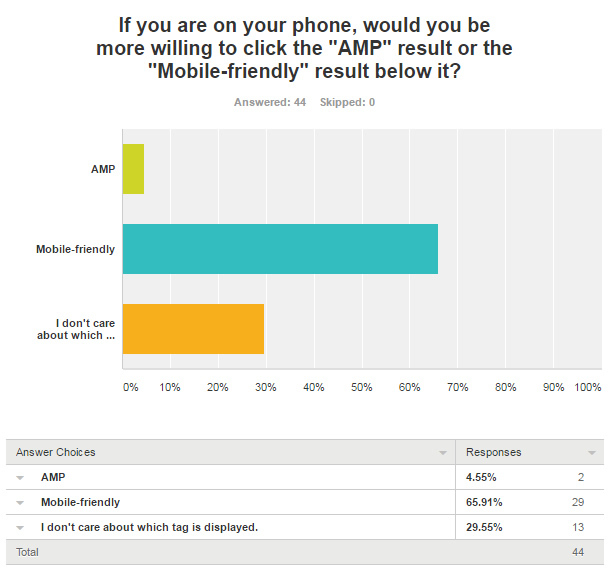 So based on a quick poll to 44 people outside of SEO, it seems most didn’t know what AMP is, and they would be more willing to click the clearer message of “mobile-friendly” versus the AMP listing. Again, I’m not saying my poll represents the entire world of internet users, but it could represent more than you think… I’m not sure what I was expecting from the results, but I sure wasn’t expecting only three people to know what AMP is, and only two to say they would click the AMP result versus other listings. OK, so we know Google is pushing AMP hard and we know that AMP provides a lightning-fast version of the content. That’s great, but the other piece of the puzzle is having users actually know about that, and then select it in the search results. And based on my poll, I can’t help but think that AMP has a branding problem. The acronym doesn’t mean anything to many internet users as of now, while “mobile-friendly” is much clearer. I’m sure Google is testing this across many users, but I personally believe the icon and message in the SERP needs to be clearer to users. They need to understand the benefit first, before they click through. I don’t know if the tag should say, “Really Fast on Mobile” or “Amplified For Mobile” or “Loads Instantly”, but I don’t think it should remain as just “AMP” with a lightning bolt. Maybe Google could move towards that once more people understand what AMP actually is. Also, and this was staring me in the face in the demo Google rolled out, but they might provide a clear message at the top of the search results once accelerated mobile pages roll out to the full SERPs. For example, check out what the demo shows below. See the blue box at the top with a message about AMP? That would be smart to run for a while when AMP hits the search results. AMP is hot, Google is pushing it hard, and it provides an incredible, near-instant loading experience for mobile users. But there’s a chance that many users have no idea what AMP actually is. In addition, there are “mobile-friendly” results right above or below AMP listings in the SERPs. And it seems many are more willing to click the “mobile-friendly” listings versus AMP. I would keep this in mind when deciding whether you should roll out AMP on your own website. There are some publishers claiming low click through rates for AMP articles, and now we may know why. I hope Google addresses this soon, and before AMP hits the full search results. And when AMP moves from demo-form into the full search results, we’ll see if it ends up with an AMP tag with a lightning bolt, or a clearer message for users. Time will tell. Until then, I recommend polling your own friends and family. See what they say and understand which listing they will click on. You might be surprised what you find. I sure was.